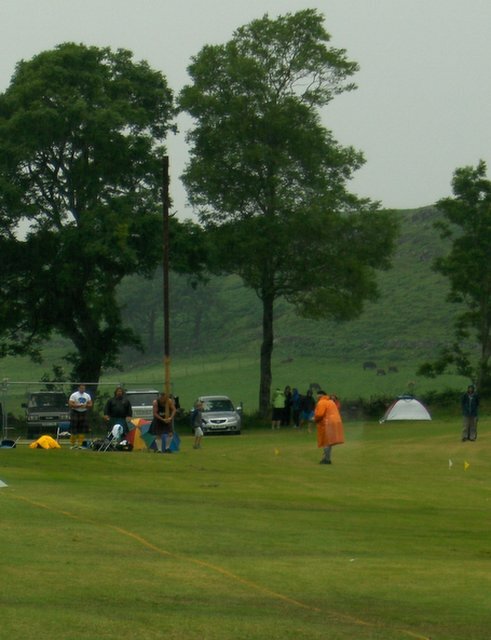 ... so why not with the Mull Highland Games on Thursday July 20th? I had never been to any Highland Games before, and although we arrived well on into the afternoon, we got a good taste of the event. Here's the iconic view of the Caber Tossing event. What I loved most about this event was the judge, who, while being an expert in his field, was about 190 if he was a day. He is obviously THE authority on caber tossing in the Mull area. You can see him there in his bring orange raincoat and kilt. Here are a few more shots taken that day before we wimped out because of the rain. Don't get me wrong, it wasn't a total washout that day, or any day during the two weeks, but it was getting a bit wet for lightweights like ourselves. Actually, we were'nt the only ones to wimp out. EVERYBODY bar the competitors wimped out.